Erte (1892-1990), "Bird in a Gilded Cage" Limited Edition Serigraph, Numbered and Hand Signed with Certificate of Authenticity. 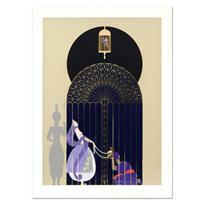 "Bird in a Gilded Cage" is a limited edition serigraph on paper by Erte (1892-1990), numbered and hand signed by the artist. Includes Certificate of Authenticity. Measures approx. 30.5" x 41" (border), 25.5" x 36" (image). Due to the age of this piece and the delicate nature of the paper it may have some slight imperfections. Born in St. Petersburg in 1892, and expected by his father to follow a military career, Erte confounded the Russian Fleet Admiral by creating his first successful costume design at the age of five. 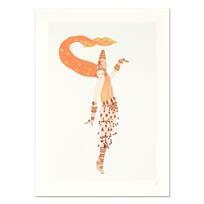 Not until he was 20 years old was Erte finally allowed to move to Paris in 1912 to pursue his passion for fashion. Erte enjoyed a long career as a fashion illustrator for Harper's Bazaar magazine, and gained fame as the creator of gloriously extravagant costumes and stage sets for the Folies Bergere in Paris, and for George White's Scandals in New York. 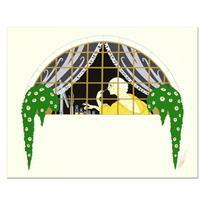 He also designed for the opera and traditional theatre, and made a brief appearance on the Hollywood scene in 1925. 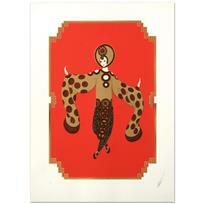 Erte disappeared somewhat from the fashion scene in the years following World War Two, only to have his glamorous career re-launched in 1967 by London art dealer Eric Estorick, who was greatly impressed by Erte’s vast body of work. Effectively taking New York and London by storm, the duo also introduced a new generation of fashionistas to Erte’s spectacular Art Deco creations. With demand for his work at an all time high, Erte found that while the wealthy happily paid top dollar for his original pieces, young people of limited means were clamoring for something they too could afford. This led to a decision to create multiples, first of graphics, and later, of bronzed sculptures. During the quarter century of Erte's "second career," he achieved a level of fame which rivaled the first, if only for its wider reaching expanses. 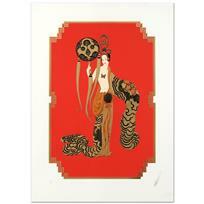 Erte (1892-1990) - "La Toilette" Limited Edition Serigraph, Numbered and Hand Signed with Certificate of Authenticity. 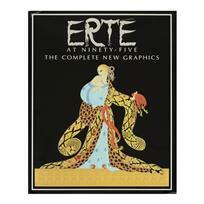 "Erte at Ninety-Five, The Complete New Graphics" This Fine Art Book Features Art from "The Father of Art Deco", Erte (1892-1990), Hand Signed. 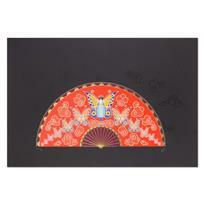 Erte (1892-1990), "Madame Butterfly" Limited Edition Serigraph, Numbered and Hand Signed with Certificate of Authenticity. 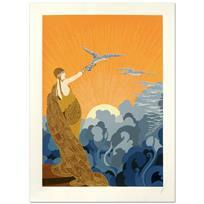 Erte (1892-1990), "Wings of Victory" Limited Edition Serigraph, Numbered and Hand Signed with Certificate. 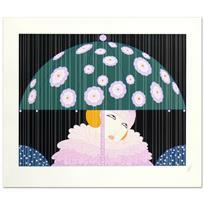 Erte (1892-1990), "Spring Showers" Limited Edition Serigraph, Numbered and Hand Signed with Certificate. 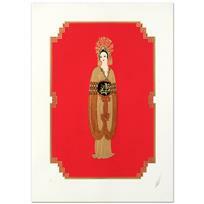 Erte (1892-1990), "Arabian Nights" Limited Edition Serigraph, Numbered and Hand Signed with Certificate of Authenticity.